I was asked to write a paragraph on the ‘feeding of conifers’. So I sat down and came up with this. But the question, “How do you feed conifers?” when given a short answer, can lead to serious misunderstandings and to fatalities. Well, yes. But one has to read quite carefully and then do EVERYTHING. It is not feasible to pick one that you like and ignore the others. You cannot feed according to my method and don’t care what substrate you have or what your watering regime is. There is no such thing as an ‘ideal bonsai substrate’. There are in fact thousands of ideal substrates. I believe that IT DOES NOT MATTER WHAT YOU USE AND IN WHAT MIXTURE as long as it is a modern substrate. With modern substrates over-watering is almost impossible. You can water for hours and all of the excess will just run through the pot if the correct substrate is used. It is very easy to under-water though. 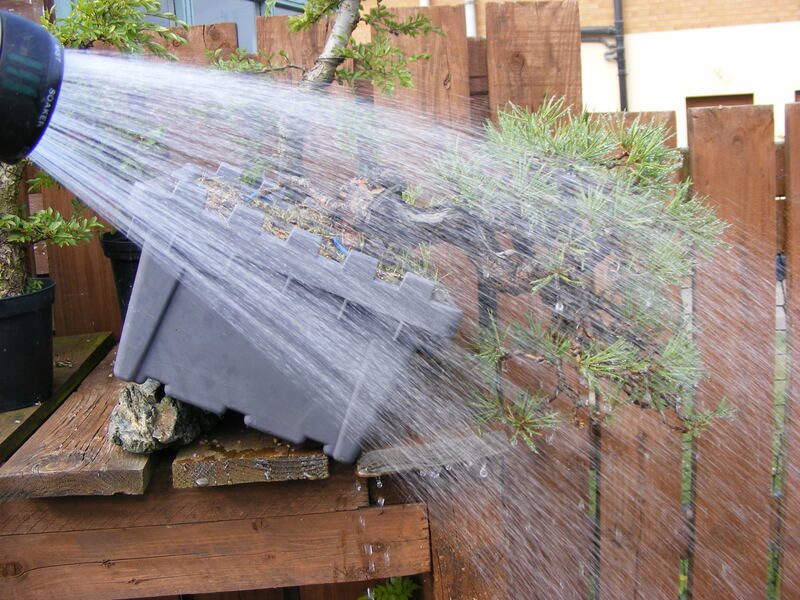 Many bonsai die because they are sitting in modern substrate but are watered according to the old methods – under-watered in fact. I use mainly liquid fertilizer that I get from our cheapest general discount market. In America it would be Walmart. Use general fertilizer that is noted as being good for all plants. In addition I buy a few dozen boxes of granular fertilizers which contain chemical and some organic ingredients. Two times a year, in the beginning of May and in the end of August, I throw a handful of dried chicken manure at the trees. I buy this in large bags, which is very inexpensive. That’s it. For ALL of my trees including the world famous ones I use the same fertilizer. How much? WAY MORE THAN YOU THINK! I feed from 20 to 60 times more than the average bonsai grower. From the beginning of April to the middle of October, every ten days everything is fed with liquid fertilizer, using three to four times the suggested dose. All trees are fed equally, whether deciduous, conifers, small, large, repotted, collected or not. This is a span of about 200 days when the trees are being fed. Since the trees are fed three times the normal dose on twenty days in that time, it makes for 60 doses of fertilizer in the growing season. The average bonsai grower feeds maybe three or five times at half the normal dose because ‘bonsai trees should not grow’. If you then add two times a year of chicken manure being given to the trees, you can then understand why this schedule is 20 to 60 times more than the average. Asian fertilizer cakes are fine but superfluous in our culture. We don’t eat steak with chop sticks and don’t have to feed plants with cakes. But they don’t hurt if you insist of using them; they are just unattractive to look at. Biogold was made to be used with modern substrates like akadama, and it works well. If you give it to me I will break it into very small particles which I then throw all over the substrate surface of the trees. After one watering it becomes invisible. Too much salt in the substrate is almost impossible if one waters aggressively every day. Even azaleas don’t mind my treatment. They thrive very well with very hard water, ordinary baked loam and peat as the substrate and aggressive feeding like all the rest of the trees. About ten years ago ‘super feeding’ was proclaimed and a while later forgotten. It did not produce the expected results and many trees suffered and even died. What I do sounds similar. Well, it is similar, only that I insist on aggressive watering in parallel to aggressive feeding and the use of modern substrates. I also don’t make the ingredients of fertilizing trees into a science. I tell you to buy whatever is on sale in the garden center or agricultural supply store. This feeding scheme is for trees in development. Remember that 99.8 % of all bonsai are ‘in development’. If you happen to have one that should really not develop anymore you slow down its feeding schedule considerably. You let it starve on purpose. Then it will get smaller, and fewer, leaves and needles. It will look good for shows, but your tree will go downhill if you continue to do this for too long. After a few years you have to feed it aggressively again to let it recover. Summary: Do all three or nothing! You have no choice here. To just pick one method and refuse the others will end in disaster. Those who do ‘super feeding’ using old-fashioned soil, and insufficient watering will kill trees. Those who use modern substrates, aggressive watering and fertilizes like the old days will have very weak and, in the end, dead trees. That’s all there is to it. I know that many will not believe this. ‘He who heals is right’, is a saying in human medicine. In gardening ‘he who has the healthiest trees in the long run’ is right. Come to see my garden or look at my gallery, they speak for themselves. A big thank you to Walter for letting us use this article. You can see 100’s of his bonsai on his gallery by clicking on the link below. Enjoy.